Please join us to open your mind to growing younger be sure to download the app https://ahrexpo.com/app and put us on your show planner custom agenda so we know you are coming. Actions Learning Emotion by Looking, Listening, Feeling, Thinking before returning a mindful reaction in a Humanistic User Experience "UX". "Emotion" is the noun used to describe the creation and depiction of a mindful interactive relationship — the conversation if you will — between the inhabitants and their physical building. It is a virtual identity, a feeling, a learning, an interactive piece, a virtual brick-and-mortar that hosts the buildings' emotion. "Building" is the verb or noun that modifies it. A mash-up of a physical fixed asset and its emotional contents creates the new Building Emotion identity.So how do we best "Look" with rapidly evolving video analytics, and "Listen" with natural language interaction and learning, using the personal assistants that are evolving as part of our edge-bots? How do we use our history of "Feeling" temperature, humidity, occupancies etc. and best combine this all with “Thinking" that will come from self-learning? Once complete we need to work a lot harder on returning that mindful reaction in the creation of Anticipatory Humanistic Relationships. 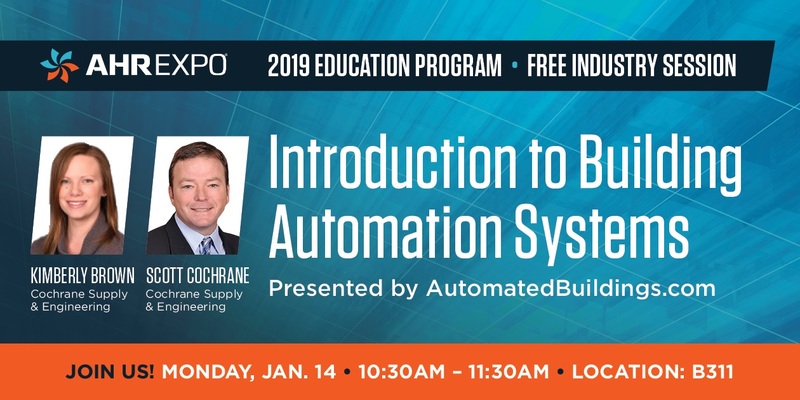 In this introductory session, attendees will get an overview of Building Automation Systems (BAS) and how they automate the operation of a building. The speakers will explain the purpose of BAS, or Building Management Systems, how it collects information about a building, and factors that affect implementation, processes, and decision-making. This interactive session will additionally build the foundation for the audience to develop an understanding of BAS, the benefits that it brings, and resources to further that knowledge based on individual needs (from basic to more advanced). This session will be a primer for entry level students and interested professionals. 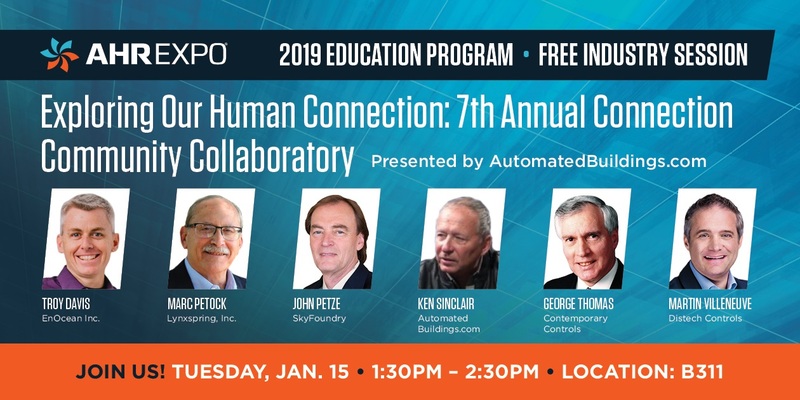 It will primarily focus on current building automation topics as well as define some of the more common industry terms such as: protocols, connectivity, interoperability, wired vs wireless, Internet of things (IoT), big data, analytics, etc. Also, the value proposition and a simple building automation system architecture will be presented for discussion. 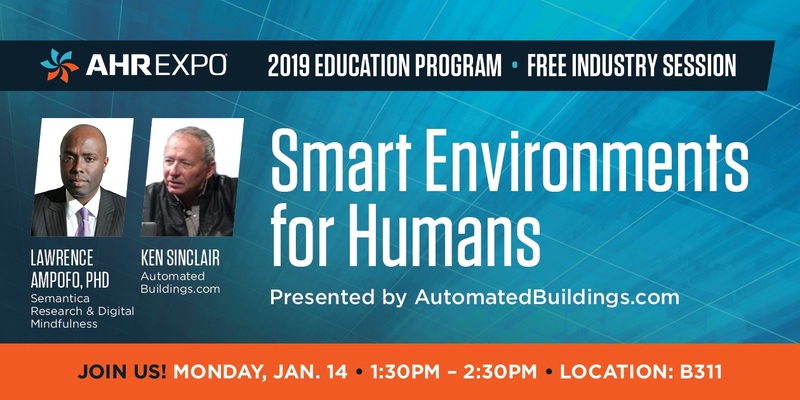 I'm unable to attend the @ahrexpo today in person, unfortunately but thankfully my talk is being delivered by @ken_sinclair. Ken and Lawrence will discuss with you "To succeed at digital transformation, instead of making humans more technical, we need to make technology more human. "Welcome to Digital Mindfulness Unlocking value and opportunities from time well spent digital experiences – Current smart environments operate on a machine level and do not understand people – New paradigm: smart environments can operate at a human level – New technological innovations (AI, Emotive Computing) and advances in scientific disciplines (neuroscience, psychology) will demonstrate this to be possible. Today’s equipment systems produce vast amounts of data. In order to utilize this data effectively to be useful to downstream applications like analytics, security compliance, work order tracking, and more, the data must include information to describe its meaning. Today, most operational data has very limited descriptive information requiring a manual, labor intensive process to "map" the data before value creation can begin. The practice of applying descriptive information to data is referred to as data semantics. Since the ASHRAE announcement of BACnet/Haystack/Brick collaboration, there is a lot of movement on tagging among manufacturers. 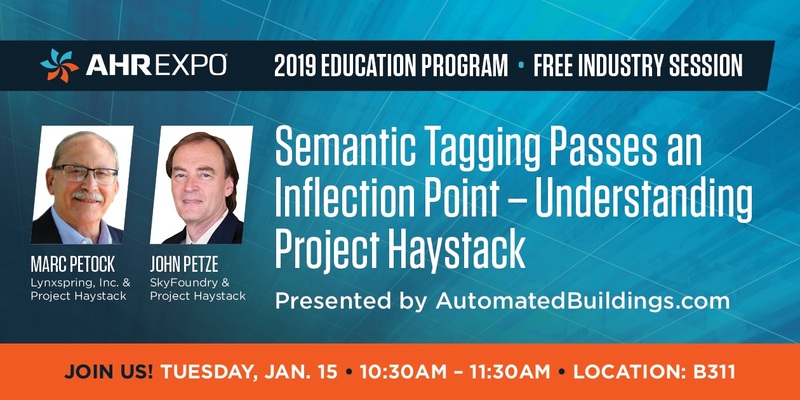 There is a mix in the level of tagging support each vendor now has for the Haystack library and the BACnet approach, but, there is no pushback regarding the need to support standardized tagging. They are either already doing it, or it is on their roadmap. They all understand this is where the industry is headed as the industry learns to utilize smart device data to reduce operating costs and create value for building owners and operators. 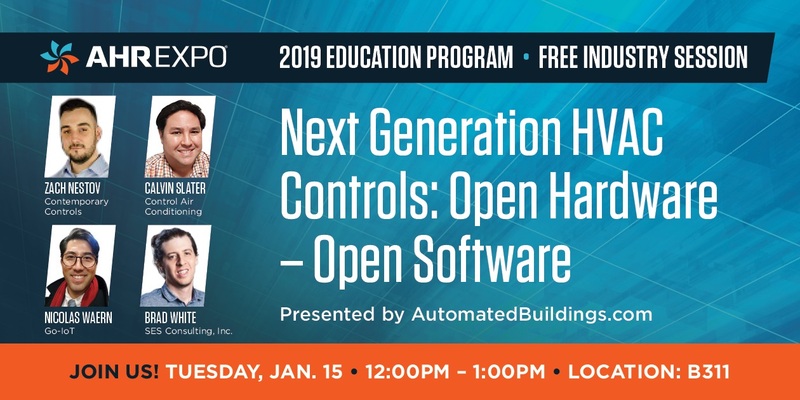 Truly open hardware and software is common in many industries but has only made relatively small inroads in the world of building automation where proprietary solutions still reign supreme. Open standards like BACnet enabled a revolution in open communications, but the vast majority of building automation software and hardware is still closed. “The mass marketing of powerful micro PCs such as the Raspberry Pi brings low-cost computing power to technical professionals and hobbyists alike. Suitable for most field installations, they also provide an excellent training and experimental platform for individuals interested in controls and automation. Coupled with an open protocol in BACnet and an open programming language in Sedona, it only takes the imagination of the systems integrator to define the next generation controller.” AutomatedBuildings.com is very pleased to introduce this amazing panel of less that forty-year-olds for this new first ever education session for Atlanta a very interesting perspective on our future by those that are now creating it. Want to read more? Contributing Editor Brad White and his fellow panelists explore the rise of truly Open everything including, Open Minds. 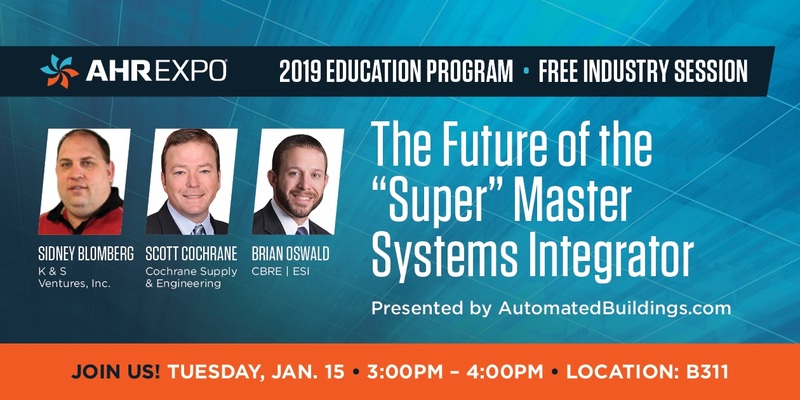 This panel session will provide an interactive analysis of the attributes of successful Master Systems Integrators (MSI), the challenges they face and how to overcome those challenges to develop into a “Super” MSI! 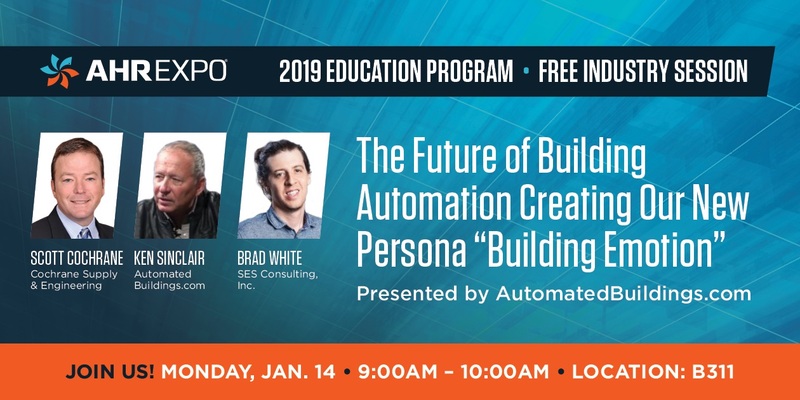 Staffing is proving to be a growing issue within the industry and the panelists will explore how to find the right people, how to bring them into this industry properly, and how to continue to develop them to build the foundation for the greatest chance of success. The discussion will take a step further and dive into the business of MSI. Panelists will show examples of different types of MSI contracts/projects and break down the MSI cost and profitably against the original proposal to demonstrate what types have proved profitable and which have not. By staying at the forefront of staffing and optimal business objectives, companies have the opportunity to develop Super MSI’s that set themselves apart and create huge value on projects within standard budgets. 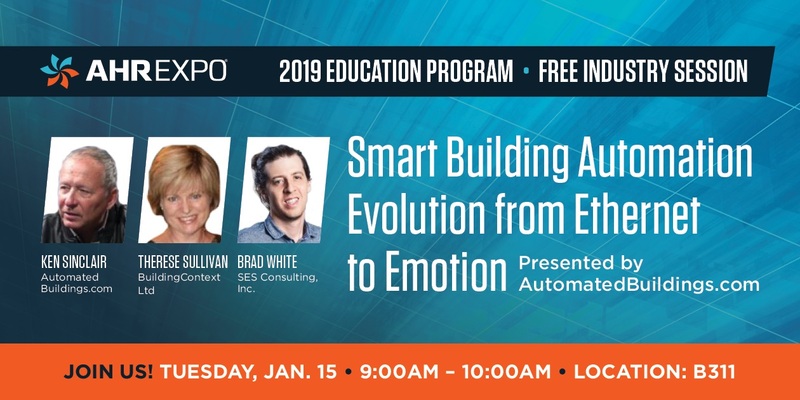 Building Emotion @ AHRExpo.com Atlanta The 2019 Show will be held in Atlanta, hosting more than 2,100 exhibitors and attracting crowds of more than 60,000 industry professionals from every state in America and 165 countries worldwide. The Show provides a unique forum for the entire HVACR industry to come together and share new products, technologies, and ideas. Brad White P.Eng, MASc President, SES Consulting Inc.